When organising your onward journey from Milan Linate airport to your final destination if you do not want to hang around waiting for taxis or stand in a bus queue, it is worth organising a private transfer or a seat on a private shuttle bus. This is an especially good idea if you are travelling with children or are in a group of more than 4 people: (Italian taxi drivers can only carry up to a maximum of 4 people and often do not carry child seats). We recommend a company called Shuttle Direct for all Milan Linate Airport Transfers as we believe they offer a good service at the best prices! If you use Shuttle Direct for your Bergamo Airport Transfer in Milan you will find they offer a good service at competitive prices! For example the cost of a private transfer from Linate Airport compared to getting a taxi into Milan City Centre based on two people travelling in the month of October with the private transfer in a saloon car or similar is: Private Transfer: €50,00 and Taxi: €46,00. With a private transfer you just collect your luggage and head for the arrivals hall where you will be met by a driver (holding a board with your name on) who will take you straight to a waiting vehicle to drive you to your holiday destination. This is certainly the easiest (and quickest) way to get from the airport terminal to your resort. By pre booking your own private transfer from you can be sure that your group will travel together and in complete safety. .If you have booked a return transfer for the end of your holiday then there is no need to call and confirm again as the driver will be at your chosen departure point at the pre booked time and date ready to take you back to the airport. 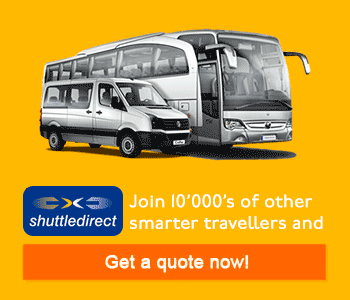 If you find the cost of a private transfer a bit expensive you might like to consider booking a seat on a private shuttle bus which stops at the main hotels and resorts close to the airport. 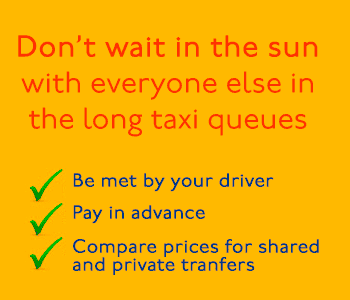 Again this can be done with Shuttle Direct and payment can be made prior to your journey, saving time when you arrive at the airport.